Benidorm is the ultimate holiday destination owing much to the beautiful and breath taking Costa Blanca. Benidorm is most famous for its seafront hotels. The nightlife on Benidorm is vibrant and it has a number of exquisite restaurants and some fantastic shopping malls. There are more than 200 nightclubs in Benidorm and around 1000 bars. The coastline of this resort town is simply fantastic and it attracts almost 5 million people every year. There are white sand and golden sand beaches, of which the most popular ones are Playa del Levante and Playa del Poniente. Tourism has always been a major part here. There are a lot of sightseeing opportunities and car hire is important for getting the most out of your holiday. The peak tourist seasons are summer and mild wintertime. There are a lot of options for accommodations here including beachfront hotels and apartments. The best accommodation options are available around Levante beach; most of the hotels there also have swimming pools and have a number of restaurants. 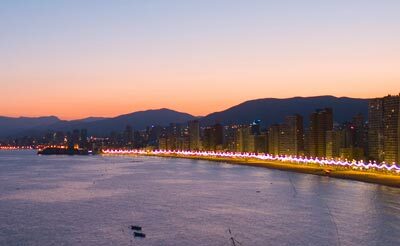 The Poniente is the quieter part of Benidorm and those who want to relax in a serene environment should opt for accommodation in this area. Car rental could mean enjoying the best of both worlds by being able to travel easily between the livelier parts of town and the quieter areas as you choose. There are a lot of water sports including skiing, scuba diving and windsurfing. Some beaches also have the options for snorkelling, banana boats and paragliding. Terra Mitica is a famous major family theme park which is close to the central Benidorm. There are a number of rollercoasters in the park among some other really exciting rides. Aualandia Water Amusement Park is very famous, and very popular with families. Tourists can also enjoy boat trips to the village of Calpe from here. There are many safari parks and gardens in Benidorm. Most of the tourists visit the Mundomar Marine Exotic Animal Park, where there are a lot of exotic animals including parrots, dolphins and penguins. The Aitana Safari Park is famous for its lions, tigers and giraffes. There is also a kid’s zoo and area for information and education about conservation. Just a short drive away from the centre of Benidorm is the Vergel Safari Park which is also home to a wide variety of animals including seals and dolphins. Benidorm car hire is very reasonably priced and could mean not having to miss out on any of these exciting and beautiful attractions. There are a number of museums in Benidorm that are worth visiting. Benidorm is not known for its museums; however, some museums have good information about the area’s past. The house museum is the most famous in the area with a number of sculptures and a lot of paintings. Temporary art exhibition functions are also held here. By choosing Benidorm car rental you not only get to enjoy everything with wonder resort has to offer, but also the surrounding areas too. The best way to discover Benidorm is by renting a car. Renting a car is easy and affordable way of transportation. With your rent a car you can explore the beautiful surroundings of Benidorm. Rentalcargroup.com works with numerous rent a car companies in Benidorm. Last month, the average car rental length in Benidorm was 6 days. The average rental car length in Benidorm is 10 days. The most booked rental car type currently in Benidorm is ECONOMY cars. Last year, the most booked rental car type in Benidorm were ECONOMY cars. How much does it cost to rent a car in Benidorm? Last month, the average car rental price was 131 USD. Last year, how much did it cost to rent a car in Benidorm? Last year, the average car rental price was 165 USD. What is the current average daily price to rent a in Benidorm? Last month, the average rental price was 22 USD per day. How much did it cost to rent a car in Benidorm over the past 12 months? Last Year, the average rental price was 16 USD per day. The car rental companies available in Benidorm are: Enterprise. See below last 5 customer reviews. Our customers rated Benidorm Car Rental with an average of 0.00 based on 0 ratings.